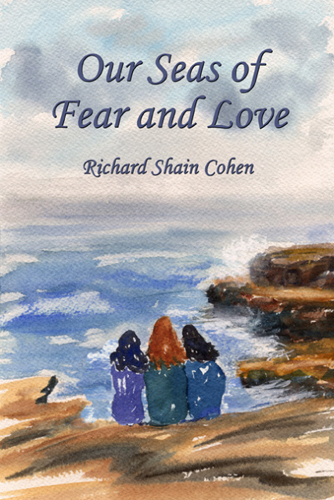 Our Seas of Fear and Love by Richard Shain Cohen is a compelling novel of an ongoing love story that spans over several decades starting after World War II. The characters are well developed and believable as they are interwoven into a story that hits the emotional highs and lows of couples through times of adversity. The story reminds us that even people of high moral standards and values can be corrupted through lust and money. This story will draw you in from the first chapter and keep you reading until the last word. You actually feel as if you are living the story which can only happen when the writing is superb like Cohen’s. Well, this is the town of Cape Astraea, Maine. Mostly everyone knows one another or about them, at least so people think. We lived in a Victorian house, two blocks off of the main street. A stream flows between the main part of town and where we, my family and I, lived. Later I inherited the house. For a few years it was vacant, oh, occasionally rented with trepidation. Here’s why the worry. There is a portico in front held by two Doric columns. The front doors have the original engraved glass. The entrance hall separates the dining room and the living room, and beyond that is a pantry through which you cross to the large kitchen. A curving banister rises along the rather high stairway, and there along the upper hall are the bedrooms, and beyond these is a sitting room that looks out on the street. Well, at least you may get the idea. We loved that house, my family and I. My mother, the singer, my father, Aaron, a doctor, my brothers and sister, Mary, who would go to medical school. She’s a lesbian. Yes. We’ve come to accept it. Intelligent people must. That’s what we call ourselves. But, you see, they knew nothing about my secret with ships and the sea and wouldn’t for years. Our Seas of Fear and Love is a romance-family saga set primarily in Maine but also in Europe and Boston. Calm and stormy seas are emblematic of the characters, their influence upon one another and, the conflicts and love expressed among the four main characters — Brigit, Deirdre, Gregory and Etienne Moreau, a man who searches out art treasures to sell to museums. He takes as his partner Deirdre, a dark haired, vivacious beauty he meets during World War II when she was an OSS member and he was head of a Maquis group. Brigit, an extremely attractive red-haired woman and nurse cares for Gregory wounded during the war and who becomes a well-known medical researcher. Gregory and Brigit have fallen in love and plan their marriage. Deirdre then sets her sight on Gregory, ignoring her lover and partner Etienne, and a conflict occurs between the two women. In the end, the effects of love triumph in contrast to vainness that damages self and others as the seas of fear and love engulf all. Our Seas of Fear and Love will be published soon and will be available online and in brick and mortar bookstores.